À 13 heures 30 mn ORDER, LIVRAISON AUJOURD'HUI. 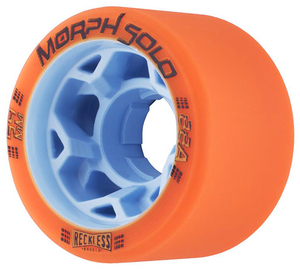 The radically advanced dual-pour Morph Wheels have just introduced a baby brother. The Morph Solo is a single durometer wheel with all the high quality features of a Morph Classic. The Morph Solo has the same great link core, same great formula, same speed and grip, in one pour at an affordable price. The Solo has solid edges for consistent roll without the grippy ‘tracking’. Without the softer edge you will get more of a controlled slide or ‘break’. Get the new Morph Solo, cutting edge derby performance at a cost-effective price. RDH Recommendation: A very good allround solution is to combine 2x 88A with 2x 93A. This combination works great on nearly all floors - you'll always have enough grip and is almost always fast enough.